Matte nails are a look I personally love, but have never tried. So when the opportunity arose for me to try out a matte nail polish, I jumped at the chance!! 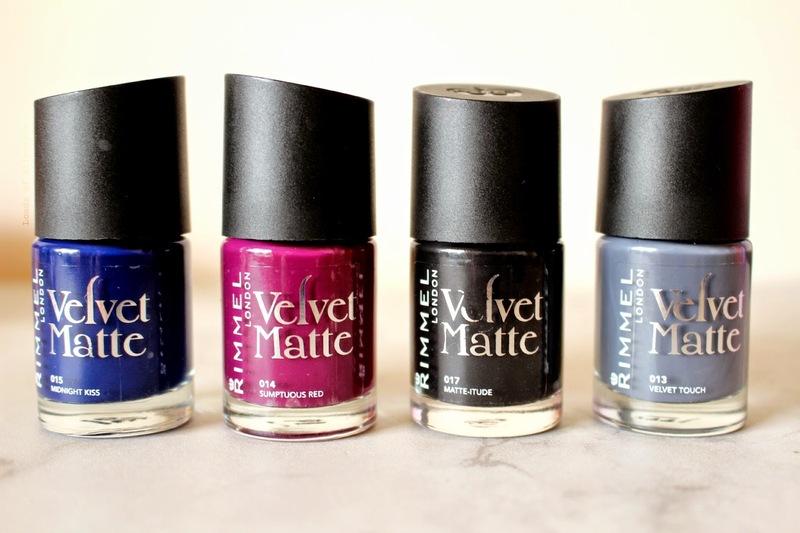 Rimmel London's new nail polish range 'Velvet Matte' comes in 4 luxurious colours all perfect for the upcoming cooler months here in the southern hemisphere. Application: the formula is quite thick, and dries super fast, however is a prone to be a little bit streaky because of the fast drying time. I would recommend either several super thin coats or 1 or 2 thick coats to try to prevent streaking. 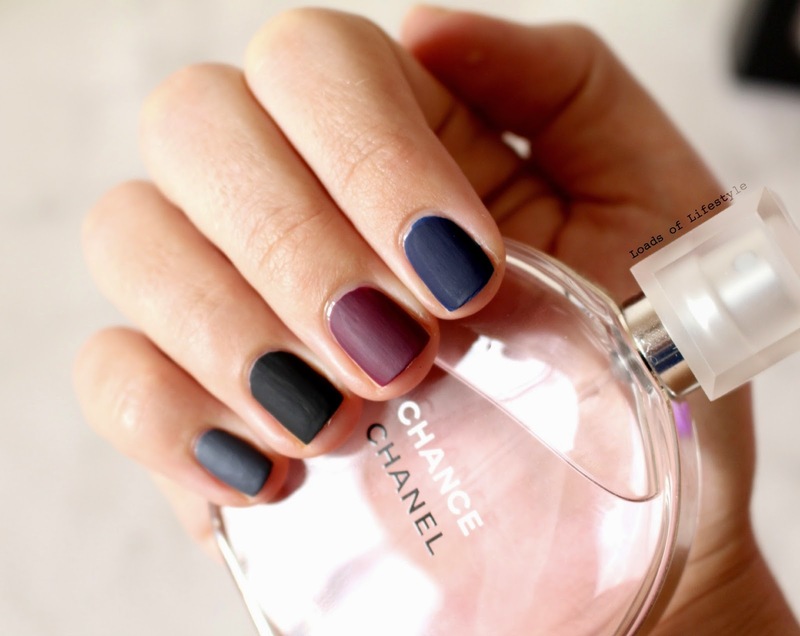 The polish then dries to a beautiful matte finish, no top coat required! Two thick coats of Velvet Matte applied to each nail. Longevity: I have worn both 'Midnight Kiss' & 'Velvet Touch' on my fingers and toes, and with most nail polishes on my fingers, only lasted a day or two before I saw little chips starting to appear. However that happens with ALL nail polish I wear, these may last longer on you. On my toes however, 'Velvet Touch' is still going strong, 3 weeks and has only just started to chip (and only one chip at that). My favourite colours from this range is 'Midnight Kiss' & since having put 'Sumptuous Red' on one nail for the blog post, I think that will be the next colour I paint the rest of my nails in! 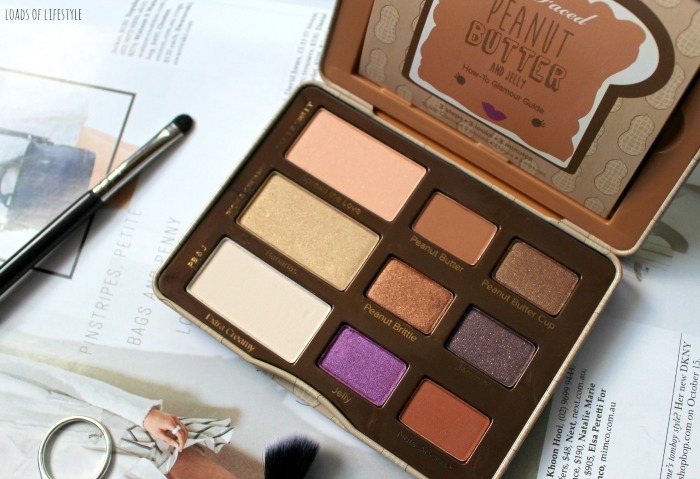 Note: Any products marked with a * have been provided to Loads of Lifestyle as a PR sample and for my consideration. All opinions are 100% my own. These look friggen fantastic! I am loving Midnight Kiss, really like navy nails at the moment.